On the 19th February 2008, ten-year-old Shannon Matthews disappeared from outside her school in Dewsbury, West Yorkshire. Hearing of the family’s plight, and realising that his services might be of help, psychic medium, Joe Power, got in touch with Karen Matthews — Shannon’s mother — and organised a sitting with her. Shannon was found a week later, at a house a short distance from Dewsbury — belonging to 39-year-old Michael Donovan, Craig Meehan’s uncle. 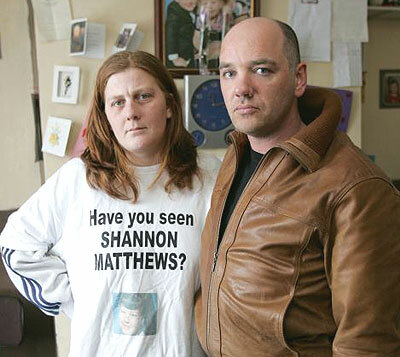 “The British media interviewed me extensively about the Shannon Matthews case. It truly shows how accurate my (spirit) guides are when I work with them on criminal cases." This glowing assessment of his own work doesn’t seem unreasonable, when one considers that everything that Joe Power said later proved to be entirely true. Weirdly, though, when I went to The People's website this morning to find the account of Joe Power’s meeting with Karen Matthews, I found it makes no reference to him saying any of the stuff he claims to have done on his website. “The car had a baby seat and a brown cushion in the back, and a religious card hanging from the rear-view mirror. “I can see a lay-by near farmland". The car driven by Michael Donovan — Shannon’s abductor — was a silver Peugeot. No one has ever bothered to verify if it had a brown cushion in the back. Or if it had a card hanging from the rear-view mirror. Since Donovan lived alone and had no children, a baby seat in the back of the car is unlikely. It is likely, however, that Shannon and her kidnapper drove by 'a church' — considering she was abducted from outside her school in the middle of town. His final assertion — that he could see “a lay-by near farmland" — is just wrong. Twenty four days after going missing, Shannon Matthews was discovered concealed in the base of a divan bed in Donovan’s flat. She had been kept in his home throughout the period, and it later transpired that Karen Matthews had been aware of her whereabouts all along. Shortly afterwards, Shannon was taken into care and Michael Donovan and Karen Matthews were both arrested for kidnapping and false imprisonment. Evidently, Joe Power had wrongly guessed that Shannon’s kidnapper had already killed the 10-year-old and dumped her body in 'a lay-by near farmland’. Since this was later found to be entirely incorrect, it was obviously omitted from the revisionist account of her 'case’ on his website. Many psychic mediums are able to justify the work they do, because they are in a unique position to bring comfort to the bereaved. This is not what Joe Power seems to be about. Joe, like Derek Acorah (who recently informed a number of British tabloids that missing Madeline McCann was dead — and, as a result, upset her already-devastated parents), seems keener just to generate headlines and raise his own profile. Joe Power’s spirit guides would appear to be about as accurate as the contents of his own 'case files’.